Meshi was founded in 1998 by Hadassah Zuravin and her daughter Lifsha Feldman, who refused to accept a neurologist’s dire prognosis for their granddaughter and daughter, Ruchama. Although the infant’s disabilities seemed overwhelming, these women set their sights on creating a new, unprecedented rehabilitation center for Ruchama and countless other children in desperate need. Since its inception, Meshi has set a new standard for the care and education of children with severe neurological and muscular disabilities. The handpicked staff has been given the freedom to initiate the world’s top treatments to provide the very best care. Like Ruchama, Meshi’s children are now making truly gigantic strides to reach their potential---and beyond. Today, 196 children, from age six months to 13 years are enrolled in Meshi’s nursery, kindergarten and school. Due to a grave shortage of space, nearly 70% of all new applicants must be turned away. The unflagging, grassroots efforts of Meshi’s founders, staff and parents has resulted in the creation of a rehabilitative center like no other. Its one-on-one care, wide range of intensive therapies, unique client-centered approach, innovative and pioneering techniques, and top sophisticated equipment combine to create an unprecedented framework for treating and educating severely disabled children. At the start, Meshi worked in partnership with Jerusalem’s Alyn Hospital, until Meshi’s growth compelled the establishment of its own facility. 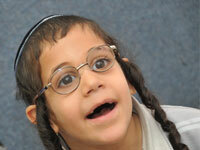 In 2001, the Donald Berman Meshi Educational and Rehabilitative Center in Jerusalem opened its doors. Children residing outside Jerusalem began enrolling as well, and soon children from across the world started coming for Meshi’s intensive summer therapy sessions. By 2003, Meshi’s student population had grown—and so had the students. 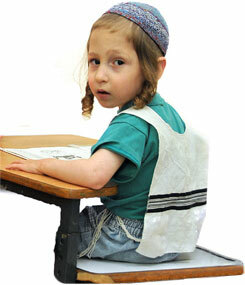 That year the Meshi School was opened, today serving grades one through seven. Meshi’s physical facilities have constantly been forced to expand to meet the needs of the rapidly-increasing student body. The Early Childhood Center has been repeatedly renovated. Nearby, the Meshi School is housed in a main building, plus an adjacent apartment for the overflow. Unfortunately, the distance between those facilities—and the need to go outdoors-- places a particular hardship on the children. At Meshi, it is not the medical assessment, but rather the family—and eventually the children themselves—who are active participants in mapping out the overall goals and treatment to be pursued. Parents and children work in tandem with Meshi's multi-disciplinary staff to create an individual therapeutic and educational program, and together they evaluate progress and satisfaction. Meshi's top professional team includes teachers, psychologists, social workers, physiotherapists, occupational therapists, speech therapists, animal therapists, music therapists, nurses, and rehabilitation and teaching assistants. Bountiful one-on-one sessions give each child the personal attention and encouragement he or she needs to thrive, bolstered by structured therapeutic exercises in a group setting that encourage peer interaction and social development. Small classes, each with its own team of teachers and therapists, provide an ideal balance of social interaction and personalized attention. A medical advisory board composed of leading Israeli physicians is closely involved with Meshi's staff, providing ongoing training and consultation. Dr. Amichai Brezner, director of the Pediatric Rehabilitation Department at Sheba Medical Center (at Tel Hashomer Hospital), personally oversees Meshi's professional staff. Experienced nurses are on duty at all times in both the Early Childhood Development Center and the Meshi School. The best state-of-the-art equipment is purchased or adapted for every single Meshi student, each year. Meshi's supply of hundreds of pieces of state-of-the-art equipment includes power and manually-operated wheelchairs, specially equipped chairs, standers, walkers, benches, scooters, seats, bicycles and tricycles. Many children require the full gamut of apparatus, which is constantly adapted or changed as the child grows and develops. Beyond helping Meshi's children stand, walk and speak, these devices also enable children to play and to gain independence and mobility for interaction with teachers, therapists—and the world at large. A paramount goal to help each child reach his or her potential, and the highest degree of independence and quality of life. A host of "success stories" on all levels. The children at Meshi were either born with neurological disorders such as cerebral palsy or a developmental birth defect such as spina bifida, or they developed muscle or nervous system disorders as a result of a disabling illness or injury. Most of the children in the younger--six months to three years-- group have cerebral palsy and many are capable of high cognitive functioning. The majority of the children have multiple disorders that include vision, hearing or speech impairments. Parents are valued partners in the evaluation and learning process, playing a crucial role in setting goals and reinforcing student progress. They are encouraged to actively participate in their child’s development, attending therapy sessions and learning how to apply similar treatments at home. Meshi’s psychosocial team offers private therapy to parents, as well as a range of group therapy sessions. Within the sessions, guidance is given on all levels--from parents confronting the new reality of their baby’s disability, to those whose child is “graduating” from the security of Meshi to enter a regular school setting. To give parents some welcome rest and relaxation, Meshi offers a recreational “day camp” for mothers, as well as maintaining a Respite Center where children are cared for during short overnight stays and Shabbat and holidays. The Respite Center provides not only a stimulating environment for Meshi children, but a sorely- needed break for emotionally and physically exhausted parents of special children. Physical therapy: Therapists use a host of methods to improve motor skills needed for crawling, sitting, and even breathing, through sensory motor stimulation and practice with specialized equipment. 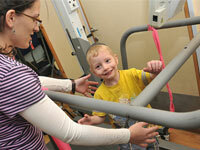 Meshi’s custom-equipped gym and fitness equipment enhance therapy in a dynamic, fun environment. Occupational therapy: Meshi’s well-equipped occupational therapy facilities provide a full range of specialized gear and methods to improve both body coordination and perceptual abilities. 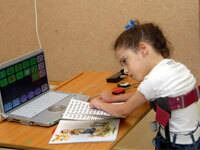 Here specialists work to maximize each child’s ability to perform daily living skills independently. And through the creative use of special games and play, occupational therapists help children improve their fine motor coordination—and have fun, social interaction in the process. Music therapy: Music therapy opens doors to communications with a child, bolstering his emotional health. It also taps artistic sensibility by developing children’s listening skills, rhythm, movement, and coordination. Hydrotherapy: Water removes the “enemy” of gravity, making paralysis disappear for a glorious opportunity to move freely underwater. In regular sessions at an off-campus swimming pool, children enjoy specialized instruction designed to increase their strength, muscle tone, range of motion, and coordination. Animal-assisted therapy: Handling and caring for selected animals in a controlled environment provides lessons in nature, responsibility, and compassion, as it develops hand-eye and fine and gross motor coordination.